This week is mental health awareness week. 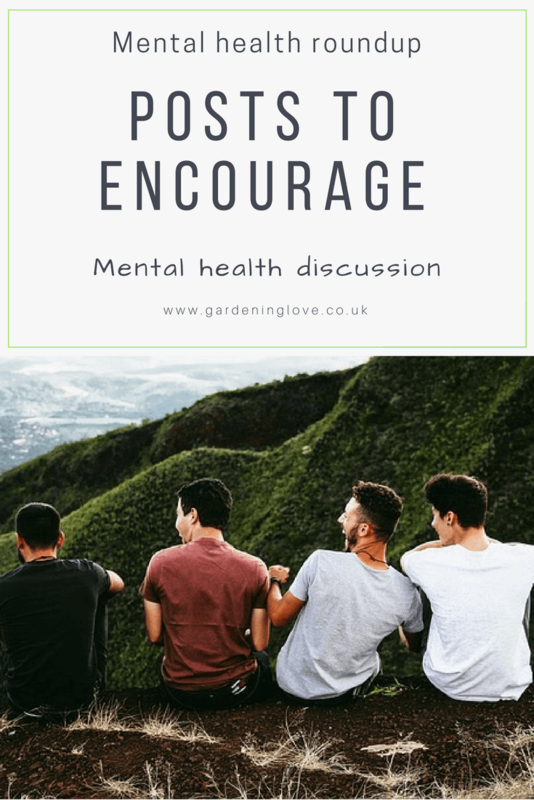 Here at gardening love I like to promote mental health awareness and encourage people to start the conversation. So I decided to kick the week off with a mental health roundup post! This week I will be focusing the topic of my posts on mental health issues to encourage discussion and provide information. As always, whether you currently have a mental illness or not, I believe that the subject of mental health is for everyone. No exceptions. Even if you feel that none of the subject matter relates to you, I believe it is best to be informed and equipped to face mental health topics head on. You never know what the future may hold for yourself, as often these issues can creep up on you. Also its important to know what to look out for in our friends, family and strangers. We all have a duty of care to look after our mental health. If you have a healthy mental state then thats great ! It’s important to keep it that way. However if you feel that you are suffering from some of the signs and symptoms that come with many mental health illnesses then please know that there is help available. Someone out there is always willing to listen to you. The point of raising awareness is to ensure that we keep the conversation flowing. Not just for this week but for the rest of our lives. Once you have a diagnosis you can often feel very confused and unsettled about what that means for the future. For a long time I felt guilty when I laughed or smiled. I couldn’t understand how I could have fun and have depression. Some people will recover, for others they may battle forever. Here at GARDENING LOVE I like to fuse my love for nature with my passion to turn up the volume on mental health matters. There are of course many options out there such as, talking therapies, medication, support groups etc etc. I would love to introduce the amazing benefits of Ecotherapy and nature. Here are some posts you may like to read to introduce you to Ecotherapy. The meaning behind gardeninglove. Where ecotherapy takes on mental health. 5 ways to bring nature into your home. 5 mood boosting ecotherapy activities. Ecotherapy is also discussed by the mental health website, Mind. They have a wonderful guide full of activities for you to try and information on how to find local activities. So there we are folks, a quick round up of posts I feel may benefit you in one way or another. As always I would love you to share the posts with others whom you feel may like to read them. Please share your thoughts and comments below ! Good article. Nature can definitely be healing in so many ways! We have so much of it right at our fingertips or right outside our own doors. Sometimes we just need a little reminder 🙂 Thanks!